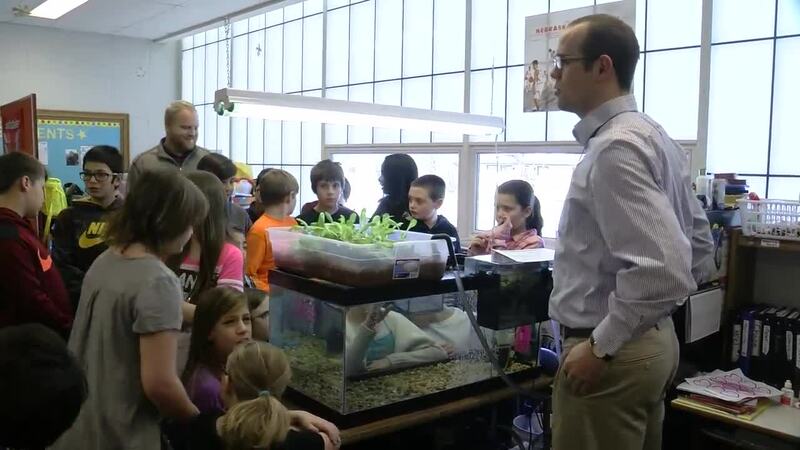 At Seymour Elementary, one of Ralston's educators lesson is a little fishy. They are using trout (specifically baby trout hatchlings) to teach interactive science. At Seymour Elementary, one of Ralston's educators lesson is a little fishy. They are using trout (specifically baby trout hatchlings) to teach interactive science. The teacher said they started the program because they thought it would be a great way for students to learn science in a way that involved hands on application. The trout in the classroom program is provided by Nebraska Game and Parks and is funded by the Nebraska Environmental Society through the Nebraska Lottery. All of the equipment and materials are provided at no cost to classrooms. More than 50 classrooms throughout the state of Nebraska that participate this program. Last year was the first year Seymour participated in the program where students see the trout hatch from eggs and then grow. The kids then release the fish at Schramm Park in May. The lesson is also used to partner special-needs and mainstream students for partnered learning. Students with special needs buddy up with a group of 6th graders who help them with the weekly lesson.